The format of this interesting film reminded me of Shoah with its juxtaposition of long tracking shots of scenery and close-ups of individuals responding to questions from an off-screen interviewer. 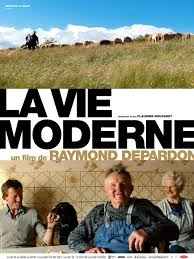 The subject is very different though – an observation of the contemporary lives of a disparate group of farmers in the remote, mountainous Cevennes region in France. The director spent a long time building the trust of the farmers and this shows through the comfortable use and acceptance of silence between questions and answers. The oldest participants are two brothers, both lifelong bachelors who had recently handed over the main operation of the farm to their nephew and his new wife, whilst continuing to look after a small flock of sheep. Their weather-beaten faces and their simple way of being illuminates the film – as if they have literally grown out of the surrounding hills. The language used by the farmers is also striking in its simplicity and complete lack of self-pity or intellectual wiseacring. All of the farmers who are interviewed seem to carry a deep-seated acceptance of their situation, even when one of them becomes too ill to continue his daily work. One elderly husband and wife were struggling with the economic realities of keeping their small farm going, with more land turning to “scrub” and the costs of keeping the animals rising. This was in contrast to another, younger couple who were building a new house in an otherwise derelict village. 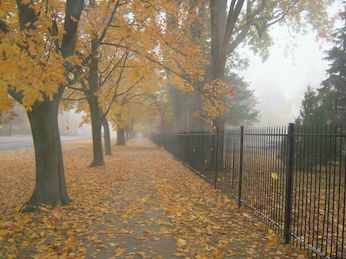 What is most touching is the way in which the honest feelings of the participants in their different situations are captured without words. There are some extraordinarily beautiful sequences of the hills, accompanied by the haunting music of Gabriel Faure which convey a sense of going back in time. This is a quietly shocking film which raises some deep-seated questions about our connection to the earth and what happens when that connection is threatened. Recommended.